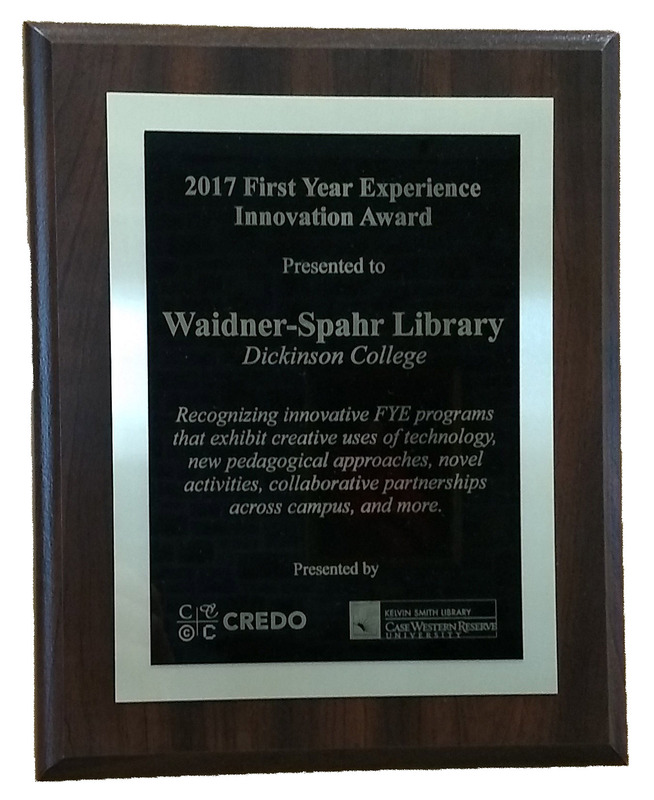 The Library won this award for our college-wide information literacy program. It is given to acknowledge a library's contributions to the development, advancement, and support of information literacy instruction. The award is open to all types of libraries, academic and non-academic alike, and thus is very competitive. It is the highest award achievable for excellence in information literacy programming. For more information, see the LIRT Awards page. The prize money from this award funds an annual prize for sophomore or junior Dickinson College students who produce an exemplary research project. Chris Bombaro (Associate Director and Class of 1993) and Rachel Suppok (Friends of the Library Intern and Class of 2016) wrote the application for this award. The Library won this award for our first-year information literacy program. The award committee noted that we were “chosen for strong collaborative efforts, established assessment practices, and proven record at improving learning outcomes. The library’s integration of information literacy (IL) into the campus’ First Year Seminar (FYS) Program resulted in 89% of participating students surveyed reporting that they used the IL skills learned during their FYS in other courses. For more information, see Credo’s announcement. The prize money from this award funds an annual prize for first-year Dickinson College students who produce an exemplary research project. 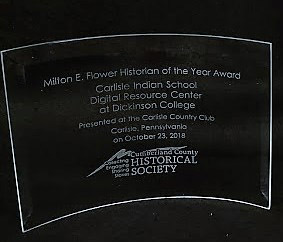 This award was presented to staff members of Archives & Special Collections for the Carlisle Indian School Digital Resource Center (2018). This online resource has for the first time digitized and made publicly accessible letters, newspapers, student records, and other materials related to the Carlisle Indian Industrial School that operated in Carlisle, PA between 1879 and 1918. The site’s leadership has also visited many Native American communities and provided toolkits for classroom use. Archives staff members who helped to create the Carlisle Indian School Digital Resource Center include Jim Gerencser (Archivist and Class of 1993), Malinda Triller (Special Collections Librarian), and Don Sailer (Digital Projects Manager and Class of 2009). This award is presented to individuals who make a distinguished contribution to reference librarianship. 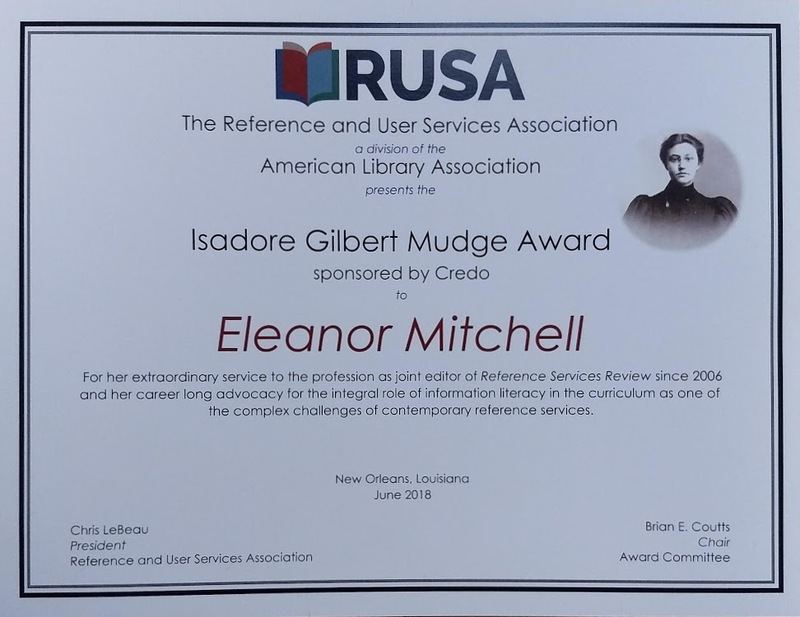 It was presented to Eleanor Mitchell (Library Director) for her 13 years of service as co-editor of the international peer-reviewed journal Reference Services Review. For more information, see the ALA’s Mudge award announcement.